Over the past four months, my house has been under major construction. During this time, we’ve faced some challenges as a family—living amidst the construction dust and bouncing from vacation rentals to relatives’ and friends’ houses. 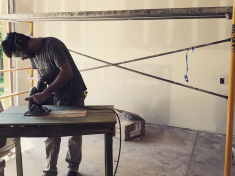 It is a huge privilege to be able to make the choice to remodel our home. But, with two small tykes running around, the experience has provided us with a small window into the impact unstable housing can have on one’s life. I’ve felt anxious, isolated, and stressed attempting to maintain some normalcy for my young kids and trying not to burden others while living in their homes. Despite my best efforts, maintaining a modicum of my normal routine, including exercise and healthy eating, has been nearly impossible. I’ve been studying the science and theory of the social determinants of health (SDOH)—or the structural determinants and conditions in which people are born, grow, live, work, and age—for many years. But, all the studies in the world can’t compare to experiencing something firsthand. My small, personal experience demonstrated just how easily, and quickly, your health can be disrupted if the conditions surrounding you aren’t stable. Historically, public health and other health care interventions have largely focused on disease control and prevention, rather than SDOH. As the impacts of SDOH have been further understood, health care interventions, including many in Colorado, have begun to address some aspects of the physical environment and, at times, economic opportunity. Very few interventions exist, however, in the interpersonal and institutional domains. Over the past two years, Center for Health Progress has been interested in understanding why that is. As we began to learn the root causes behind interpersonal, institutional, and societal inequities, it became clear that our health care system, and society as a whole, struggles to grasp where and how to intervene at these levels. We believe this is in large part due to fear, discomfort, and the politicized nature of issues like institutional racism, classism, and other systemic oppression. We can develop health care interventions that tackle unstable housing, food insecurity, and transportation because we’re comfortable talking about these issues and they are easy to grasp, but we haven’t asked ourselves why certain populations and individuals consistently, disproportionately face these challenges. Colorado leaders are beginning to have brave new conversations about inequity. And nationally, health care leaders are beginning to wrestle with these intractable issues in the public sphere. As an organization, we have been an active participant in these conversations and I believe it’s beginning to turn toward action. If we are to truly achieve health equity and eliminate preventable health disparities, we have an obligation to address institutional and interpersonal root causes head-on. In doing so, we can find commonsense solutions that transform the health and lives of our neighbors and make Colorado stronger. Unfortunately, the discussion of social determinants as a dominating factor for the level of Unstable HEALTH experienced by any citizen or group of citizens is clouded by the lack of precision for the definitions of HEALTH, COMMON GOOD, Social Capital. Further more, our Nation lacks a strategy to mobilize the legitimate local Stakeholders 1) to foster their own community’s conversation about these issues AND 2) to promote their own community’s Plan to optimize their local HEALTH, COMMON GOOD and Social Capital. A case can be made that the post WWII, generational transitions have left many, if not most, of our nation’s community’s with a Social Capital level that is inconsequential for the civil life of their community. The effects of this occur daily and impinge on each person’s family network involving our home, our extended family, neighbors, Community and nation. It is unlikely that “the way our” will occur without a Nationally sanctioned strategy to promote HEALTH, the COMMON GOOD and Social Capital, community by community. The Smith-Lever Act passed by Congress in 1914, could be amended by Congress and implemented within 6 months. Remember, the industry affected by this Act is the most efficient and effective among the OECD nations. Our healthcare industry is the least efficient and least effective among these nations, by a wide margin.